I may have bitten off a little more than I could chew this weekend. I bought a piece of plywood fully intending to whip it into three separate projects, but by Sunday evening we’d only completed one and a half. I’m here to show you the half. The bifold doors covering our pantry have always left something to be desired. They’re a pain to open and close, they don’t actually cover the full width of the opening, they make it difficult to access the far right side of the pantry, and, most importantly, they’re not my style. So they had to go. I had good intentions to donate them to the ReStore but after several minutes of trying to gently remove them from the track I got impatient and told Nick to “just go Hulk on them,” and he ripped them out. The ReStore has a ton of those bifold doors anyway. Bam. I removed the hardware that was holding it in and the old plastic thingamabobber too. I think it was a motion detector for an old security system that was housed in the pantry (you can see that white metal box on the second to top shelf that houses all the circuit board and stuff. If I decided to have an electrician come drop a new light box for me I may have him remove that box, as well. So now–so exciting–I need new doors! You can see in this old photo that there are already two different styles of cabinets in our kitchen. If they all matched I might have felt obligated to make my new doors blend in, but since they were already different I figured I could get away with doing something a little different (read:easier). Let’s call it eclectic. I bought a 4′x8′ sheet of 3/4″ plywood at Lowe’s for about $50. I wanted to get the birch but they weren’t really labeled clearly and I think I ended up with “blondewood.” I don’t think blondewood is a real thing, probably some generic term for whatever cheap lumber they’re milling, but whatever. I was planning several projects with this one board so I made a diagram to plan my cuts and asked the staff at Lowe’s to make a few of them before we left so we could get it home more easily. This one piece was 76″ by 26″, and the only cut we needed to make at home was one splitting it in half vertically. I also bought four lattice strips for the trim, so we clamped one of the lattice strips to the plywood to use it as a straight edge for the jigsaw. This white balance is kind of crazy in the next few photos. Sorry about that. Even with the straight edge Nick’s cut still wasn’t perfect. We put the two outer edges together so that the edges that Nick cut were on the outside (where they’d be less noticable) and planned to use trim to give it a more finished look. I figured the easiest way to trim it out and still have a professional look would be to do a shaker style. So we used four inexpensive lattice strips to frame out the perimeter. Nick used the same miter box that we used to cut the trim for the beadboard and it was really easy. We placed the two middle pieces first so we could make sure they went together nicely, then filled in the rest of the pieces. I attached them with finish nails and just like that, we had two doors. Now I just need to fill the holes and gaps with wood filler then sand, prime, and paint before finally hanging them and attaching the knobs. It’s not nearly as easy for me to get things done during the week, even on the days that I’m not working, so I’ll be thrilled if I can just get them painted and ready to hang by Friday. Nick and I are far from handy. I have a bit of an advantage in that I come from a long line of DIYers on both sides of my family, but the fact that I am not at all detail oriented holds me back. And I am not even exaggerating a tiny bit when I tell you that Nick could. not. hammer. a. nail. when we bought our house. I’m serious. I had to hammer all the nails. But the idea of home improvement is very appealing to me and so obviously as soon as we moved in I started planning projects. Nick is not so interested in this sort of thing but he goes along with it for my sake. And since we’re both cheap (Nick more so than me) and money doesn’t grow on trees the only way we’re ever completing any of these projects is to do them ourselves. So how did we gain the skills to get ‘er done? Google. Lots and lots of google. The internet is full of quacks but it can also be a wealth of knowledge. Before I start any project I research extensively, reading as many blog posts and other resources as I can from other folks who have tackled similar projects. I take notes and make a list of the supplies required and the steps I’ll need to take. And since Nick is not at all interested in spending his free time reading about home improvement I then take what I’ve learned and coach him on what I need him to do. I’m really lucky that he usually just goes along with whatever plan I’ve got as long as I’m not busting our budget. We were driving to Lowe’s the other day to pick up supplies for our beadboard backsplash and we were almost there by the time he turned to me and asked as if it’d just occurred to him, “What’s beadboard?” I couldn’t help but laugh. Good ol’ Google. Can’t beat that with a stick. Ana White has lots of tutorials on woodworking, furniture building, and even home construction. That Home Site/GardenWeb are great for researching purchases, renovations, outdoor projects, and, of course, gardening. Use the search feature to find forum threads related to your topic. Pinterest is great for finding pictures to help you decide the look you’re going for. The search box is your friend! Take notes, make lists, and have confidence. We’re not going to be tearing down walls anytime soon, but for less complex projects like creating a garden where there once was grass or even replacing a backsplash you can absolutely gain the skills you need with internet access and a bit of determination. I believe in you! Y’all, I am so excited. This is probably the most intense DIY project Nick and I have ever taken on and it’s going so well! We are not naturally handy, detail oriented, or at all skilled in this sort of thing, but with some determination and a lot of googling we’re getting it done. Friday afternoon Nick brought a truck home from work and we went to Lowe’s to pick up two panels of beadboard ($40), a jigsaw ($40), some brads for the brad gun that someone gave me secondhand a few years ago ($5), and an L-shaped straight edge thingie to help with measuring and marking ($4). Our total after tax was just under a hundred dollars. That night after Jack was in bed we dragged the panels into the living room and I marked out where to cut all the pieces with a sharpie. I’d already measured everything and drawn it on a piece of graph paper to help me make the most efficient use of the two panels so I just referred to my diagram to transfer the cut lines. Then I resumed my normal Friday night activity of wine and television. The lighting is all kinds of terrible in every single one of these photos so please forgive me. I guess I was too excited for photography! Jack is well past the age of playing happily on a blanket while we go about our business and we don’t have any family here in town to keep him, so we were limited to working during his 2-3 hour afternoon nap. On Saturday we brought the panels out to our back deck and set them up on our makeshift sawhorses (a pair of ice chests) and got to cutting. I’d brought the clamps out thinking I would need them to clamp down a straight edge, but Nick said it was actually not too hard to cut a straight line with the jigsaw. This man could not even hammer a nail when I met him and I was so impressed to see how quickly he got in the groove of this project (especially since I’d initially assured him that I would do it all myself!). Let this serve as an example that if we can do it, you can do it. With the pieces all cut out we brought them in and checked to see how they fit. We had to make lots of tweaks and little corrections and this was definitely the most time-consuming part of the project. In fact, this is as far as we got on day one. The minute Jack was down on Sunday we started cutting out all the holes for outlets. We did this by putting a rolled up piece of painter’s tape on the outlet, pressing the beadboard into place, then pulling it away to reveal where the tape stuck on the back. We would mark the spot and then Nick would cut a small rectangle (drilling into the corners first to create a space for the jigsaw blade), then line up the plate cover with the (now visible) outlet, trace it, and cut just inside the perimeter. This post does a much better job of explaining it, but I didn’t have any lipstick and wasn’t confident enough to cut a big hole without being able to visually confirm that we were in the right spot so we modified her technique a bit. Even with our careful cutting there are still a few spots where the hole will be visible after the face plate is replaced. I’m hoping that I can fill them in with some scraps and caulk. I should note that my original plan was to cut all the outlet holes at the same time after marking them based on my diagram, but I’m glad that we took the time to mark them in place. Nothing fits perfectly in my 90 year old house and we probably would have had lots of mismatched holes. I also was going to paint them all before installing but, yeah, that didn’t happen. We worked one piece at a time double checking the fit, cutting the outlet holes, and then nailing it to the wall. Most tutorials I read mentioned using adhesive in addition to nails, but honestly it seemed unnecessary to me and I imagine that someday beadboard will be sooooo ten years ago and the future owner will be able to remove it much more easily if it’s secured only with nails. We used 3/4″ brads along all the edges of each piece and trust me, they aren’t going anywhere unless they’re pried off intentionally. We replaced the outlet covers temporarily for safety but we still need to install spacers to bring the outlets themselves forward to be flush with the beadboard in addition to installing trim, filling random gaps, caulking all the edges and, finally, painting! Big time gaps happening over here. Nothing some scrap pieces and caulk can’t fix. The old backsplash only went up a few inches but I decided to bring it all the way up to the height of the pantry over here. I’m going to hang some shelves on either side of the range as my next project, so just imagine them floating in front of the beadboard. The tiny little gap under the pass-through is what held me back from doing this project for a long time, but once I started reading tutorials and learned that I would need to use trim along all the edges I realized that I could just use a thick trim that would cover the entire space. That’s Phase 2! It’s still very much unfinished but I can see it coming together! I’ve got my fingers crossed that I can get all the trim installed this week, but I don’t move nearly as quickly working on my own as I do when Nick is helping and, of course, I’ve got other responsibilities. If I don’t get ‘er done by next weekend at least I’ll be able to take advantage of Nick’s reluctant assistance, haha. Even if you didn’t read yesterday’s post about my plans for updating our kitchen you may have already known that I recently removed our tile backsplash thanks to these two pics I posted on instagram and facebook. I read a bunch of online tutorials about collecting various tools, protecting the countertops, etc. etc., but as I sat on the sofa researching I looked over into the kitchen and decided I had nothing to lose by just going for it. So on a sleepy Sunday afternoon right before Christmas I grabbed my hammer and a flathead screwdriver and chipped out just one tile, just to see how hard it would be. It came right off, so I knocked out another one. And another one after that. And before I knew it I had tackled a whole section. I thought briefly about whether I might damage the counters, but, ya know, whatever. I figure that if I haven’t scratched them so far with just my regular careless/clumsy daily behavior then they must be pretty tough (they’re quartz, which a quick google search tells me is, in fact, highly scratch resistant). But if you’re wanting to try this at home and are working with a more delicate surface maybe try taping down a dropcloth or even some thick paper. This was my technique: position the screwdriver flat against the wall with the tip resting just behind the top of the tile. Then tap, tap tap with my hammer until the screwdriver is wedged in there nice and deep. 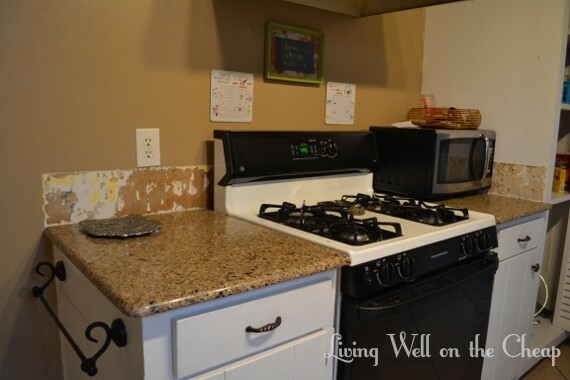 See that crack along the bottom of the backsplash where it meets the counter? Another quirk of living in a house that was sort of haphazardly renovated by previous owners. I could have fixed it with some caulk but now I never get around to it. The new beadboard backsplash will be trimmed out at the bottom and probably caulked as well. From there I could use the screwdriver to pry the tile off. Sometimes they came up several at a time and sometimes I had to fight for each one. The drywall got messed up pretty badly in the process but, again, whatever. I’m covering it with beadboard. What I feel less cavalier about but still didn’t address properly is the issue of lead paint. I didn’t think about it until I was more than halfway done and by then I figured I may as well just go ahead and finish and do a good job of cleaning up all the dust afterwards. So that’s what I did. Hope I don’t regret it. I am so glad it’s done! This is definitely one of those cases where things look worse before they get better. I’ve started cutting in with the new paint on the walls and am hoping I’ll get a chance to roll on the rest sometime this week, then I can start the process of hanging beadboard (painting before I install the backsplash will save me a little bit of cutting in around those edges). I’m SO excited but trying to take it slow and not get ahead of myself. No beadboard will be purchased until those walls are painted!